Let’s start with a tail. Or the tail. Mju Mju’s tail. We had some lovely, talented people visiting who took some beautiful photos that I will soon scatter around the site. We moved to Istria on 14. April and waited for sunshine since. It has finally arrived and I finally felt inspired to post photos of many things that happened since. In the meantime, we celebrated Easter. Then soon after work started. This time last year I was crazy with getting everything ready for an inspection and “categorisation”. Which we did and it all went more than well. 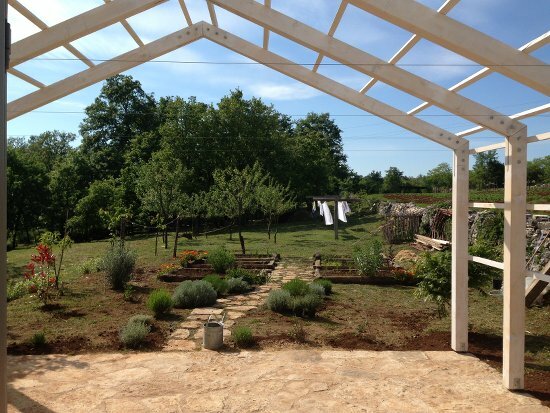 As we were so busy making everything as nice as possible for our guests, our terrace was left unfinished, without very necessary protection from sun. So, first project to rectify this this year was to build cover for our terrace. You can see a very keen wisteria in the foreground (anxiously) waiting (for two and a half years now) to start climbing up something. It is not small. Photo by another talented friend. Mr Architect Vjeko himself. The frame is up – now we “only” need to decide to add the actual shading something. Hard life for Biba and Miki. Photo by Helena Cuculić. As soon as one project finishes, another one starts. While debating (for at least eight months) where to put the much missed last season decent bbq, our genius builder Tone suggested one day that we could convert the old outside toilet (that we left thinking it was nice to leave it there as a testament to good old times). And, while at it, why not build a wood fired oven as well. Did you ever built one we asked. No, but I repaired one – how hard can it be? So, full of faith, we said – why not? I always wanted one and thought we would build one in years to come – not really this soon, wasn’t really top priority. But seize the opportunity of Tone’s enthusiasm and the existing toilet we did. Couldn’t find better picture of the initial state – this is how it was before we even bought Pruga – a bit overgrown. It went down in about an hour. And then slowly started going back up. Amazing construction to build the dome. Current, unfinished state. As we are quite busy with guests (yay!) we stopped until the small gap we have in June where I hope we will finish. The oven to the left, bbq to the right. What’s missing is the roof and the chimney. The theory and philosophy on building wood fired ovens is quite extraordinary. I read a lot. I am none the wiser. Tone seems to be farly confident. He said – it will smoke like crazy. It will probably be able to bake bread. Or with a bit of luck a pizza. No doubt there will be a post only about that once we do it for the first time. The way it looks now, it could be a tiny castle. Together with a tiny cannon. Another picture of Mju Mju as there was not an animal picture for a while in this post. We try and do some research on Istria when we grab few hours so we finally visited Kotli. Very cute and scenic. There are fairies and ghosts and goblins there. And a few people that decided to come back after the village was deserted after Second World War. Pazin – the town closest to us is becoming cool. A new place opened this winter. Great terrace for morning coffee (when our guests are kind enough to say that it is ok to serve breakfast at 10 🙂 Live gigs on Fridays. Music selection that we like. The name is Bunker. Not to forget plans from last post one swing was installed yesterday morning. The plan to do a bit more with the woodland is still strong. The bbq/wood fired oven got in a way a bit. Ah, Mju Mju. Sleeps by day, does who knows what by night. Sadly, we did not manage to save either some tiny mice nor more than one lizard’s tail. How do we get our head around that? She is still very sweet, albeit not very small cat. sve izgleda predivno, pozelili smo se zdrave hrane i sunca, jedva cekamo da dodjemo, vidimo se u utorak!